That sounds like so much fun, it is great to be with people who are really enthusiastic. Agreed! It’s funny – I’ve been out doing more bug things with more bug people here in North Carolina than I did in a whole department of entomologists in Arizona. I think it’s great! Glad to read this and live the clear, colorful Pix. Would have skipped it, but a dragonfly , obviously awakened too early, buzzed me this morning in pre-dawn light as I walked out the front door. Oh! The affrontery! 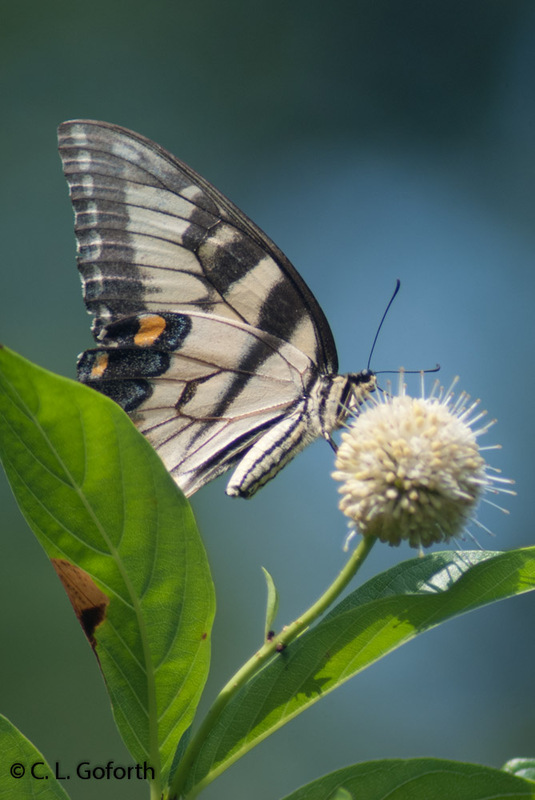 That swallowtail photo is just beautiful, great job! Nice! 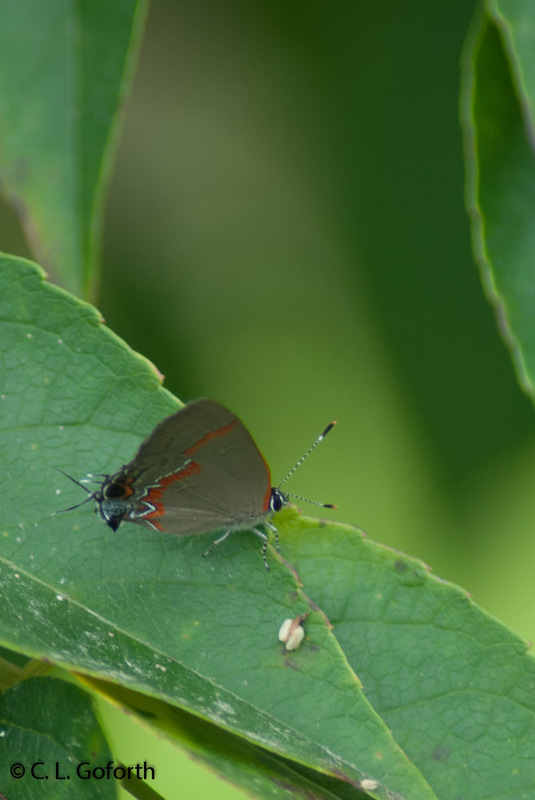 I have yet to get a good look at (or a photo of) a hairstreak, unless you count the pine elfins I saw this spring, so I’m jealous. The Audubon people were SO excited about the hairstreaks in the tree. It’s always fun to see adults get so excited they sort of start bouncing up and down and jumping from one foot to the other as they excitedly exclaim about their finds. 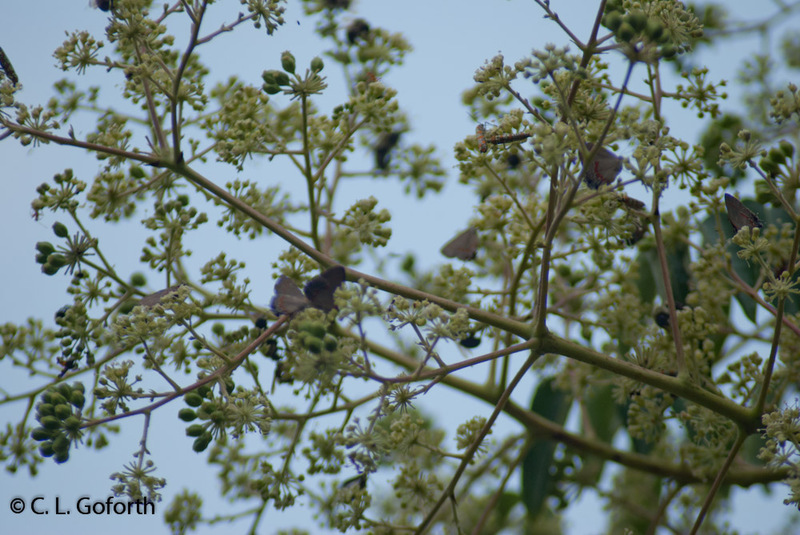 And if you want hairstreaks, go visit your folks when the desert broom is in bloom in the late summer and early fall. You’ll see hundreds! They love that stuff. 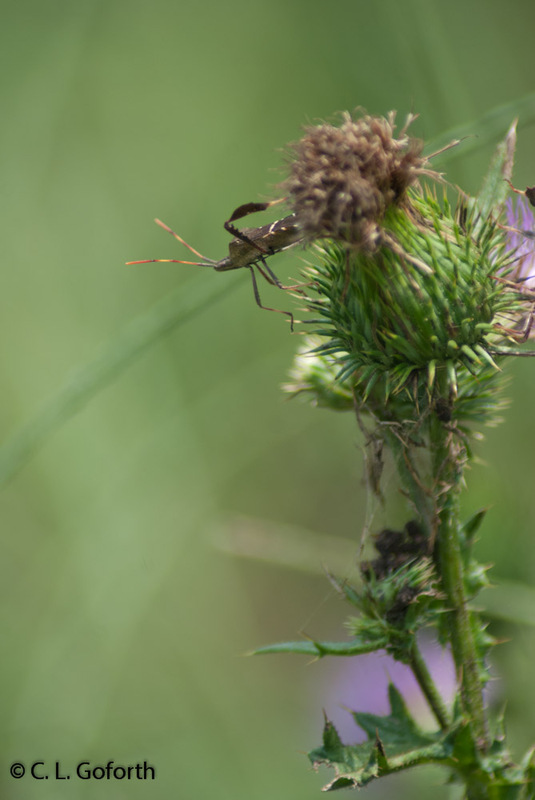 Butterflies are always beautiful – but the thistles are striking – and that caterpillar could be in a museum as a work of art – any artist trying to copy nature has a high bar to hurdle. 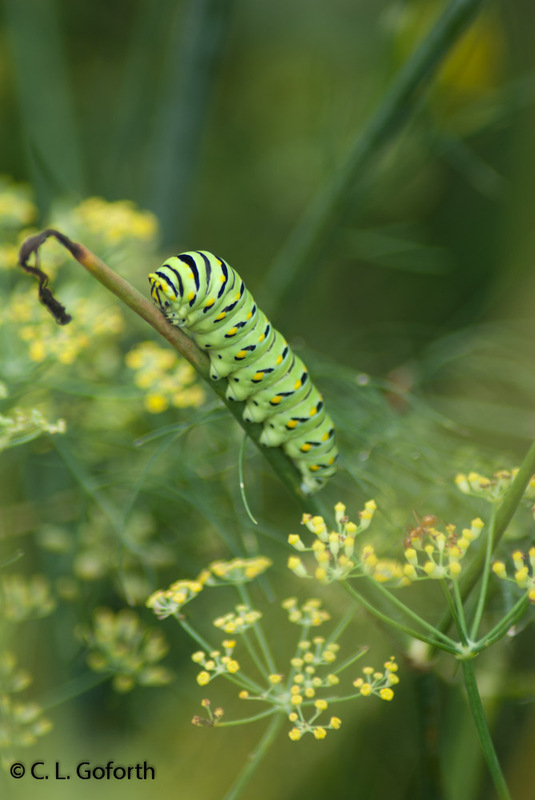 I used to raise black tailed swallowtail caterpillars as a kid, so I’ve always had a soft place in my heart for them. They’re so beautiful! And, when you touch them they evert their osmeteria and start waving their heads around trying to smear stinky fluids on you. Nature is so amazing! Do not walk. RUN away as fast as you can. You do NOT want to get involved with butterflies. A couple of springs ago, while sitting in the yard, quaffing a cold adult beverage, waiting for the first odes of the year, I realized how EASY it is to catch butterflies. AND, they are SO easy much easier than dragonflies to identify. I soon found myself catching the %#$&* things until the odes made their appearance. GET AWAY NOW!! 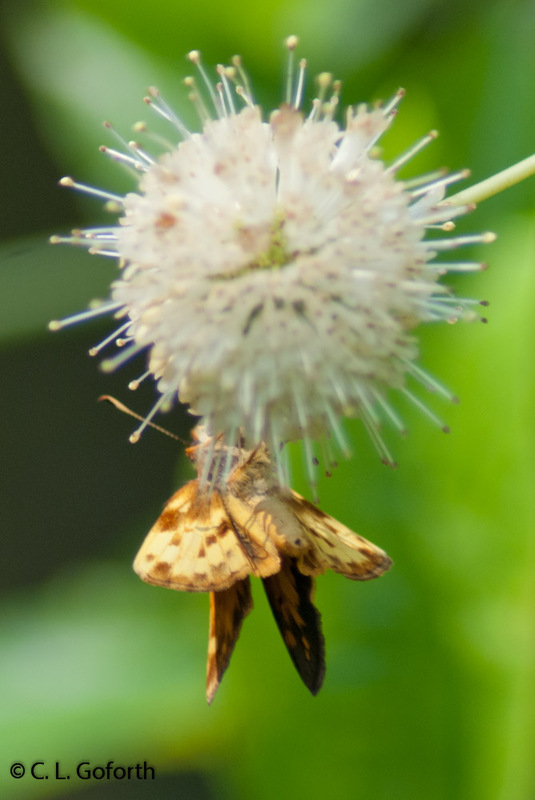 If I’m too late, check out the Butterflies and Moths of North America site at http://www.butterfliesandmoths.org. Do not listen to George. Butterflies are awesome! You will love butterflies! Like he says, they are so much easier to ID than this darn dragonflies! Oh no, Dragonfly Woman has gone over to the dark side! More seriously, I just read Mariposa Road, so butterfly faunistics are on my mind. I’ll probably never get really into identification (since it’s such a saturated field in terms of both experts and hobbyists; I enjoy the difficulty of Odonate identitication), but I enjoy that there is a whole community of very enthusiastic butterfly workers out there. I wholeheartedly agree with you about the saturated field with leps. That’s part of why I started working with dragonflies in the first place! When I was a kid doing my 4-H entomology projects, I noticed that no one else caught dragonflies for their collections. I decided I was going to include a lot of dragonflies in my collection, so I started collecting them. I soon realized that people didn’t collect them because they are hard to collect, but that challenge only made me more determined. I like dragonflies because they are hard to catch and identify. Catching them successfully means observing their behaviors closely and figuring them out a bit, knowing which ones will perch and which ones you’ll have to catch as they fly. You can’t help but learn a lot about dragonflies if you catch them! Butterflies… Well, they flit from flower to flower. You know they’re going to land, and once they do they’re pretty easy to catch. The challenge just isn’t there. They’re beautiful, but behaviorally I find them far less interesting – and that’s the whole reason I haven’t ever taken the time to learn them. I have Mariposa Road, though I haven’t read it yet. It is currently hidden in a box somewhere as we just moved a second time in two months, but I’m really looking forward to reading it! Have you read The Dangerous World of Butterflies? I thought it was fantastic! And it brings attention to several issues dealing with butterflies that people don’t normally think about. I absolutely loved it! Sounds like you had a lot of fun. I love butterflies! Butterflies have never been my thing, but I’m hoping I can learn more about them. 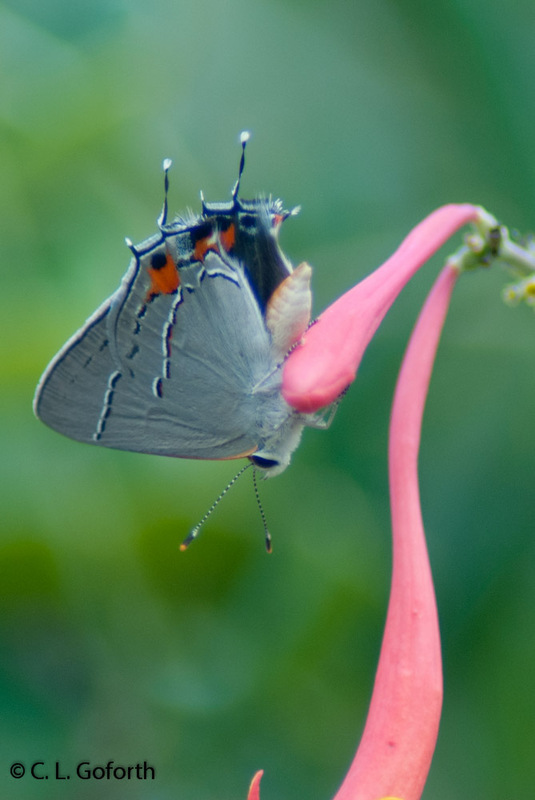 Being out with a group of enthusiastic butterfly watchers is a good way to get started! There’s no point in being only one kind of person. Life is full of amazing things. I’m a odonate person, a butterfly lover, a spider fanatic, and an admirer of snakes. I love walking sticks and harvestmen. I’ve never met a preying mantis without being amazed. I may not be a normal case, though. I have field guides for animals I’ve never even seen, much less needed to identify. And I’ve read them! I tend to take your approach for most things, though I have a few groups of animals I’ve just never bothered to identify because SO many people study/watch them: butterflies and birds. There is almost always someone in every group that can tell you something about the bird you’re looking at or a butterfly that lands on a flower next to you. There are far fewer people who can tell you anything about the insect that is swimming around in a pool of water or the walking stick hidden out in the grass. I have always tried to focus my energy on the things that are less well known, though I have rather broad tastes. And, even if I don’t know my butterfly or bird species, that doesn’t make them any less interesting to me! I do love life! Any kind of life, from the little slug I found on my bed one night that my dog tracked into the house to the enormous poison ivy vine that’s choking the life out of one of the trees I can see from my window at work. I might not know every detail about everything I see, but wow is the natural world amazing! Draggy, My Love. I would be most hurt if you became the Butterfly Woman. Thank you so much! I am glad you like them.